1. 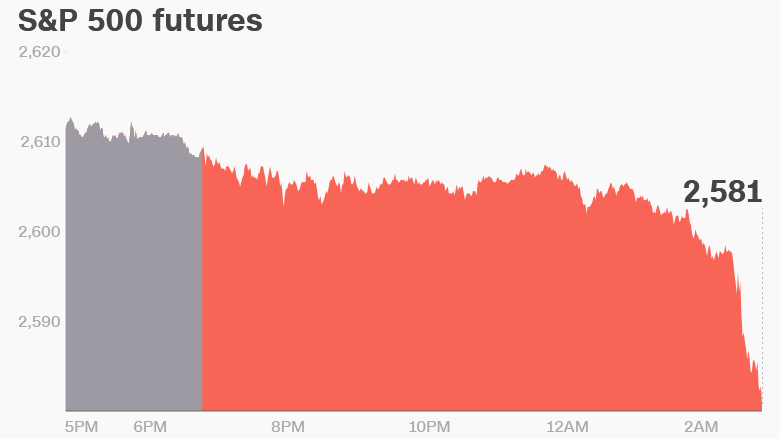 China strikes back: US stock futures moved sharply lower on Wednesday after Beijing announced plans for heavy new tariffs on dozens more US goods. The Chinese Ministry of Commerce said it plans to impose a 25% tariff on $50 billion worth of US exports, including aircraft, soybeans and autos. It didn't state when the tariffs would go into effect. Market reaction to the retaliatory measures was swift. Dow, Nasdaq and S&P 500 futures were off by 1.5% or more. Shares in General Motors (GM), Boeing (BA), Ford (F) were sharply lower premarket. The price of soybeans tanked. Hong Kong's Hang Seng, which had been up in morning trade, closed 2.2% lower. European markets registered losses in the range of 1%. China's announcement comes less than 24 hours after the Trump administration published a list of about 1,300 Chinese exports that it plans to target with tariffs. Key areas of focus include China's aerospace and manufacturing industries. "What the United States has done is in total ignorance of the essence of the mutually beneficial and win-win cooperation in trade between China and the United States," Gao Feng, a spokesperson for China's ministry of commerce, told state TV on Wednesday. Investors are worried about a potential trade war between the world's two largest economies. The VIX volatility index spiked 9% early on Wednesday. US oil futures dropped 1% to trade at $62.90 per barrel. Gold, seen as a safe haven by investors, gained 0.8%. 2. Sorrell in the spotlight: Shares in WPP (WPP) dropped as much as 3% in early trade after the advertising giant said it has hired an outside counsel to investigate allegations of personal misconduct against chief executive Martin Sorrell. The company, which owns 400 agencies including Ogilvy & Mather and JWT, said "the allegations do not involve amounts which are material to WPP." The Wall Street Journal has reported that the board is investigating whether Sorrell "misused company assets." Sorrell responded in a statement: "I reject the allegation unreservedly but recognize that the company has to investigate it." 3. Spotify debut: The streaming music service is now worth nearly $30 billion after an unusual IPO. Spotify (SPOT) opened at $165.90 a share on the New York Stock Exchange on Tuesday, well above the $132 it reached when traded on private markets. The stock later fell below $150 a share. Unlike traditional IPOs, Spotify did not raise new capital. Instead it simply listed existing shares directly on the stock exchange without relying on underwriters. Analysts said that if Spotify can avoid too many wild swings in the coming days, its alternative public listing process could entice other big name companies to follow suit. 4. Tuesday market recap: The Dow jumped 1.7% on Tuesday, while the S&P 500 was up 1.3% and the Nasdaq gained 1%. 5. Economics: Crude inventories data will be released at 10:30 a.m. ET. An employment report by ADP, a payroll processor, is expected at 8:15 a.m. ET. The data will give investors a glimpse at what to expect from the March jobs report on Friday. Eurozone inflation data will be released at 5:00 a.m. ET.